Looking for a professional fax cover sheet for your business or company? This contemporary fax coversheet will make your faxes look more polished as you submit them. It includes an area for business information (address, phone, fax, and web). This contemporary fax coversheet can be downloaded instantly at absolutely no charge courtesy of myexceltemplates.com. 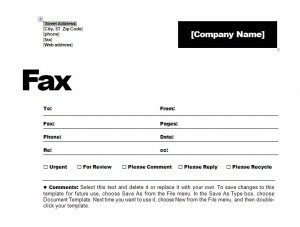 The fax coversheet featured here on this site is incredibly easy for any business person to use. All information added to the sheet can either be typed in or handwritten. The document can be edited through Microsoft Word or simply printed off blank. At the top of the document is where you will put the important information regarding your company, including the street address, phone number, fax number and your web/internet address. Next to that is where you will insert the name of your company or business. There is ample space to include a company logo is you so desire. Underneath the body are several check boxes. These boxes read “Urgent,” “For Review,” “Please Comment,” “Please Reply,” “Please Recycle.” You will mark the corresponding box based on what you would like the recipient of the fax to do with it. The final section of the contemporary fax coversheet is reserved for comments. There are step-by-step instructions on how to use this section included with the coversheet template. The fax coversheet template is just one of the several dozens of templates, calculators and spreadsheets available at myexceltemplates.com that business owners will love. These helpful and time-saving tools are completely complimentary, meaning businesses will never have to shell out a cent to enjoy all their benefits.